On Thursday, March 28th, at 7pm at the Emerson Center, The Bozeman Doc Series presents the Montana premiere of the critically acclaimed new documentary Gaza. This elegantly shot and masterfully crafted portrait of Palestinian life offers a rare chance to be immersed in the heart of Gaza, as we glimpse behind the walls of this misunderstood land to get to know real people who inhabit it. Inside a Gaza City taxi, we meet a teacher, a student, and a barber, who all share their dreams and daily predicaments with the driver, Ahmed, using surprising humor and candor. Ahmed could take them anywhere—except that a decade-old blockade makes it nearly impossible to leave the enclave. Like its people, Gaza’s landscape feels kaleidoscopic: colorful yet pained, fragile yet resilient, ancient while looking to the future. Memory plays heavy on its consciousness. But life moves in cycles in Gaza, and, in spite of everything, joy and humanity can be found in every corner of this mosaic of life. 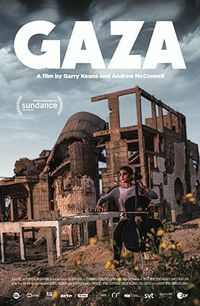 Directed by Irish co-directors Andrew McConnell and Garry Keane, Gazaworld premiered at the 2019 Sundance Film Festival to widespread critical acclaim. “Poignant and powerful…Garry Keane and Andrew McConnell’s lyrical documentary gives a face to the name, a four-corners look around this over-crowded “open prison”, as one inhabitant describes it. This carefully made film delicately avoids direct confrontation with political elements while still making clear their culpability for the devastation it surveys. Many are responsible for Gaza’s dire plight, it suggests, and by omitting them, Keane and McConnell give a solid cross-section of its inhabitants their voices back…a richly realized documentary” Screen Daily “Provides an eye-opening insight into the world of everyday people living in Gaza.With understanding and sympathy the filmmakers have managed to capture how the toils of war shape the lives of people who are trapped by it.” Film Ireland “Beautifully shot and masterfully edited…Agree with Israel’s response to Hamas or not, it’s the ordinary folks who suffer the most in any conflict between authorities. In their movie, Keane and McConnell strive to honor the basic human dignity of a people that just want to live a normal life…a searing portrait.” Hammer to Nail Doors open at 6:30pm.Tickets are available at the door or before the show at Cactus Records and Movie Lovers. Tickets are also available online at www.bozemandocseries.org, where you can also buy Season Passes and 7-film punch cards, learn more about the series, and view trailers for upcoming films. The series will continue with one screening every other week through April.